A beautiful, rustic, oak framed mirror. 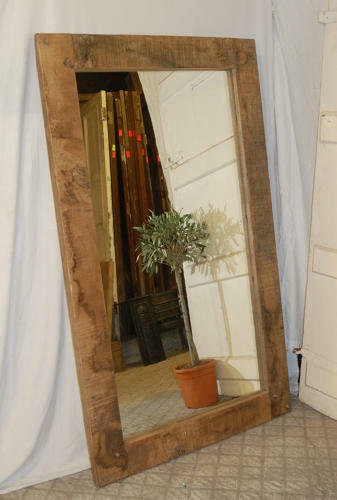 The large mirror has been made using wonderful thick reclaimed oak with a rich waxed finish. The oak has beautiful character with wood knots, cracks and attractive grain. The frame is held with oak pins and is solid and well constructed. The mirror can be hung in portrait or landscape style and would look fantastic hung above a fireplace or as a decorative feature on the wall. The oak is reclaimed and therefore has some slight signs of use and wear, giving the mirror character and its stunning rustic style. There are character cracks and knocks as mentioned and there are some slight colour variation giving a weathered appearance. The mirror glass is new. The mirror is a bespoke piece and it is unusual to find an oak mirror with such an attractive, authentic look. The mirror is perfect for a country or rustic interior and would be a fantastic addition to a home.